Still addictive enough that the awesome TF2 Halloween update takes second place. As the screenshot shows, I learned a) how to make screenshots, and b) how to play in third person mode. Scooter, one of the few characters you don't kill. Playing a mixture of single-player and co-op games is weird… you end up playing the same area several times, the first time in a fog of confusion as you help someone else with quests you haven’t got yet. You can have a fair mixture of levels, but once it gets too wide it’s less fun– I was in a game with someone 10 levels higher and it wasn’t that fun– he just swept up all the enemies. I created a second character when a friend was just starting out. There’s an appealing punk feel to the game… no appeals to your better nature, no saving the galaxy– it’s a rough and ugly planet and you’re in it for the money. And if you have several players and are fighting a horde of enemies, it can be really intense, chaotic fun. The loot system is compelling, as it was designed to be, but I’m not sure it marries well to co-op. 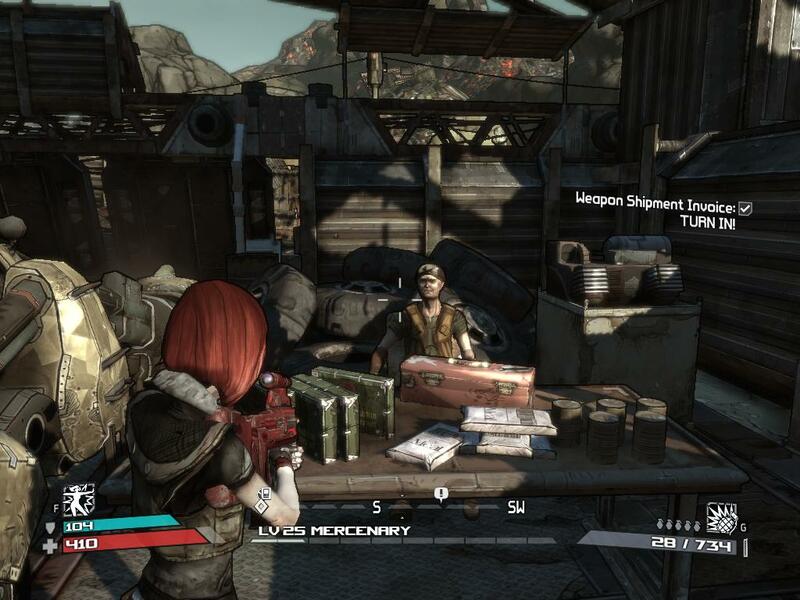 I don’t know why you’re limited so much in inventory (you start with just 12 slots)– it forces you to make decisions constantlyon what weapons to keep, and in co-op you don’t want to hold everybody up while you ponder. Doubling the slots or more would only improve the game. You want to try out all these weapons, or be able to save one or two for a friend. It’s annoying to pass over drops because you have no slots or can’t easily evaluate if they’re better than what you have.